This was insprired by this puzzle. This follows the rules of a classic Bongard puzzle: find the rule that all shapes on the left follow, but none of the shapes on the right do. Assume that the third example on the left is perfectly circular outside of the two missing wedges. All the shapes on the left have two or less outward facing corners, but every shape on the right has more than two outward facing corners. Imagine each shape edge is a string, and each vertex is a hole. Then attempt to pull each string taut. Straight edges will remain the same, but curved edges will shrink until they become straight. Then, the shapes on the left will no longer be closed shapes (either becoming points or lines). 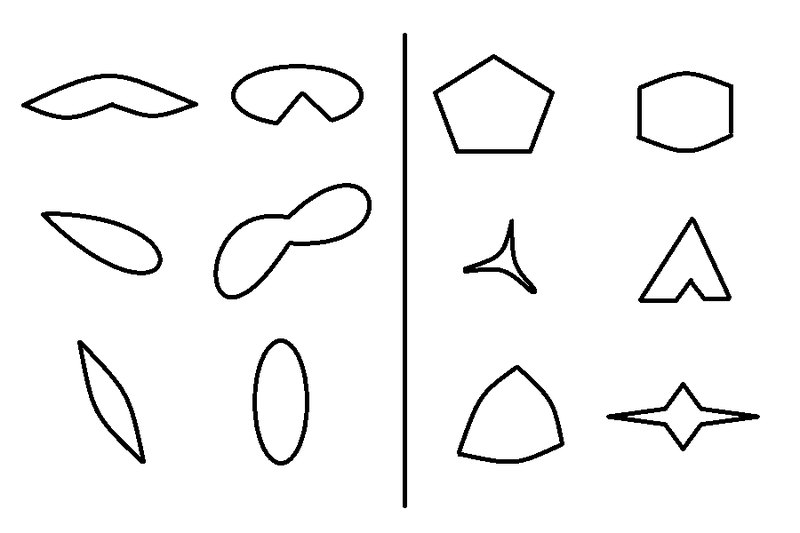 The shapes on the right remain as closed shapes. The contentious one is the pac-man shape (left panel #2/top-right). Perhaps when pulled taut, the string follows the contour of the two existing straight lines, therefore producing a caret (not a closed shape) instead of a triangle (if you were to simply connect the vertices by straight lines). The top-left shape is also contentious; if the three vertices are not collinear, you get a closed triangle upon pulling the strings taut. All the left ones have only axis of symmetry, whereas on the right they have more than one axis of symmetry. All of the shapes on the Left have a vertical line to their right, while none of the shapes on the Right do. A stretch until I can think of another answer. 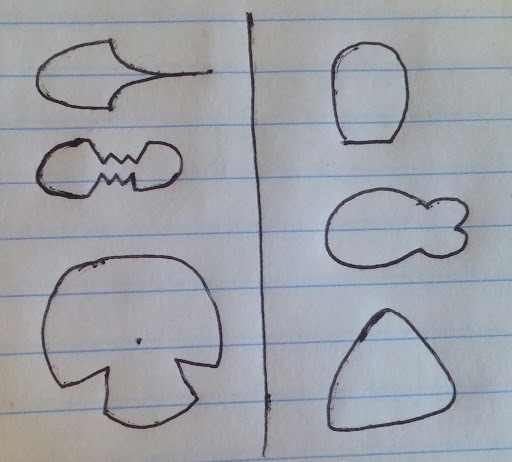 Every shape on the left can be stretched into a circle, but those on the right cannot. Not the answer you're looking for? Browse other questions tagged pattern lateral-thinking science bongard or ask your own question.